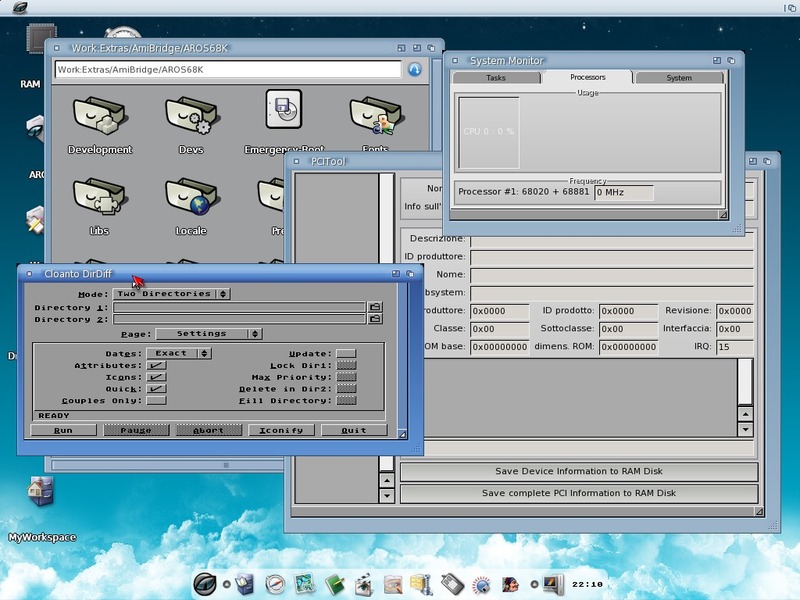 For some years, integrating Amiga Forever from Cloanto into Icaros installations has been the only way to get a perfect compatibility with older AmigaOS applications, written for the classic machines. Jason McMullan and Tony Wilen, however, have been working hard on the Motorola 68K port of AROS and today many Amiga applications of the OS 2.x and 3.x era work on it, almost perfectly or with minor problems, so I decided it was time to make a new, exciting leap: offer M68K compatibility without any legacy, official KickStart or operating system files from Amiga Inc and her licensees. It's not the first trial: many months ago, long before releasing Icaros 1.4, I tested AROS for M68K processors under Janus-UAE but, for many reasons, it didn't work. I experienced important problems with UAEGFX modes and, without them, mandatory features like pointer syncing and coherency mode couldn't even be started. But Jason and others never stopped improving the Motorola flavour, and some weeks ago I could even start Olaf's AROS Vision M68K distribution under Janus-UAE. Amazingly, it could even run clipd, launchd and janusd, which are the daemons which make Janus' magic happen. So I could start AROS M68K and AmigaOS applications in coherency mode. Only a little issue still stopped me from proceeding: Wanderer couldn't save settings for backdrop. Users who commonly use Icaros Desktop and Amiga Forever to run old software already know that disabling backdrop is essential to have Workbench window correctly displayed on the screen. Wanderer could disable backdrop on the fly, but it got activated again at next reboot: in a couple of days, Jason fixed the issue and now Wanderer behaves a little more like the original Workbench: another step in the right direction had been done. So, I started a new scripting session to enable AROS M68K support under AmiBridge. The good news, however, is this time I don't need to adapt another product to behave as needed, but I can directly modify all that I want for a correct integration: once integrated, everything will be already configured and the user won't need to add anything else, unless he/she finds our compatibility with AmigaOS not yet enough mature. In this case, I will keep the ability to integrate Amiga Forever as usual. Look at the image: you can see M68K version of AROS' System Monitor and PCI Tool - notice the processor reported by the former, and the fact that there are no devices listed in the later - and an AmigaOS application from Cloanto, DirDiff. They are running in coherency mode, thanks to current AROS M68K and Janus-UAE 1.2, and - please notice - they are even using the same fonts, colors and Zune settings of the host system! That's another advantage of using AROS M68K instead of AmigaOS: since most of .prefs files are compatible between the two versions, all I needed to do was just copying settings from x86 envarc: to M68K one. I couldn't use soft links to avoid pointless replica and copy operations, but unluckily they don't work on our SFS as they should, so I went for a easy workaround. See you: in the next days I will spend some more words on this new exciting feature.